The Metro Board of Directors — the agency’s ultimate deciders — met Thursday for their regular monthly meeting. A pdf of the agenda for downloading/printing can be found here. The recap of actions, posted above, will also be posted here soon as a pdf. You can watch a webstream of the meeting here. MOTION BY GARCETTI, RIDLEY-THOMAS AND DUPONT-WALKER ON ITEM 9 that the MTA Board direct the CEO to: A. Proceed with the Vermont Bus Rapid Transit project as a near-term “Phase 1” transit improvement along the Vermont Avenue Corridor; B. Initiate the study of extending the Red Line along Vermont Avenue to 125th Street, specifically focusing on connecting the Wilshire/Vermont Red Line Station to the Expo/Vermont Expo Line Station as a “Section 1”; C. Include a heavy rail alternative in the Alternative Analysis and Environmental Studies for the Measure M Vermont Transit Corridor; and D. Report back on all the above to the Planning and Programming Committee during the July 2017 Board cycle. •In an item carried over from last month, the Board approved going forward with a more intensive environmental study of alternative two for the project that would construct run-through tracks for Union Station to allow trains to enter the station from both the north and south — presently trains can only enter from the north. The project would increase capacity for commuter rail and Amtrak and speed up the time it takes trains to enter and exit the station. Significant funding will need to be secured to build the project. Staff report and project presentation. Funding will need to be secured for design and construction. Alternative 2 involves bringing high speed rail and West Santa Ana Branch into the platform part of Union Station. 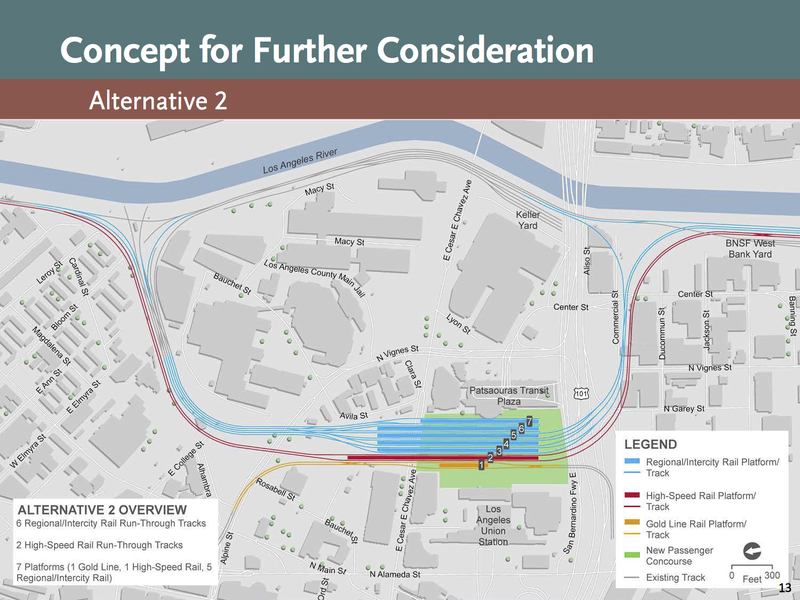 The Board also approved a motion to study a less expensive version of alternative 2 that would not include an expanded concourse under the tracks. Significant funding — as in hundreds of millions of dollars — will need to be secured to build the project. 2 comments here. First, $2.3 million for bike classes is absurd and a waste of taxpayer dollars. Metro is and should not be responsible for these tasks. There are tens of bike organizations that would willingly provide many of the same services for free. These type of expenditures are exactly what anti-Measure M people were against (I’m aware this isn’t funded by Measure M)–a waste of money by a thousand cuts. Not to mention the firm being awarded the contract (which is a real estate development company) is headed up by former City employees. This $2.3 million is much better used on capital expenditures. Second, why is Metro paying $50k per year (indefinitely?) to the Broad, a non-profit that has at least a $200 million endowment and will not only directly benefit from the Metro rail station being built near it but also directly benefit from the bridge? What is the Broad afraid of? More visitors? I understand the need for the pedestrian bridge, but why can’t Metro negotiate a better deal? I totally agree with Andrew that these bicycle classes are a total waste of money and that METRO should NOT approve this contract and, instead put this money to a much better use. There are many comunity origanizations that would be willing to provide this service for FREE. Why pay for something when you can get it for FREE? Can you explain the plan to change the allocation method for local return? From the presentation, it says the move would be to make a minimum $100k per year Local Return distribution to each jurisdiction, effectively taking some of the money from the larger cities and granting it to the smaller cities. Measure M specifically says that Local Return dollars are supposed to be allocated based on population. Can you explain how the $100k minimum distribution is permitted under Measure M? Did a lawyer actually look at this proposal and give it a green light? At this point, the guidelines on local return are a proposal and have not yet been adopted. They were released yesterday for public review and the Board discussed this particular issue. I would suggest going here http://metro.granicus.com/MediaPlayer.php?view_id=2&clip_id=661 and listening to item 8 (if you haven’t already). The gist of the issue is that some smaller cities have requested that there be a minimum amount of local return funds that they would receive, a move that would require some larger cities to give up some funds (if memory serves, at the meeting they said this would impact city of L.A., city of Long Beach and L.A. County). My understanding is that it’s not a done deal; the guidelines still must be approved by the Board, which is scheduled at this time to happen in June. What a handout to the very wealthy, paid for on the backs of the very poor. Apologies for the multiple comments, but there’s a lot of stuff in this agenda and this is why you release it to the public! In Item 26G, it says “consider assuring that the final design in this action preserves the ability to construct a potential future station in the vicinity of 6th Street in the Arts District.” However, the January motion mentioned potential stations at 1st, 3rd and 6th streets. Can you explain why mentions of 1st street and 6th street stations are not in this agenda item? I don’t know the answers off the top of my head but I’ll try to find out tomorrow! And the answer on your other question. A study on potential Arts District stations is scheduled to come out next month and include 1st, 3rd and 6th Streets. The reason that 6th Street was specifically mentioned in this item is that Metro heard the most support for a station at 6th as part of its January public meetings and the report was trying to show that the portal was not precluding getting trains all the way to 6th, which as you know is the furthest from the portal and turnback tracks. As for the illustration on page 16 of the Annual Program Evaluation, that is a mistake. I’m guessing it’s an old image that someone used. At this time, there’s no funding to build the line beyond the VA Hospital although Measure M has some funds that have the potential to be used to study it. Why is METRO still using a Chinese Company [BYD Motors] when there are American alternatives available. This company has proved to have NOTHING but inferior products. METRO needs to start buying American products, using more American products, employing more American workers. If there is no American company that can do the work or supply the product, then and ONLY then should METRO be allowed to look outside of the United States. Everything you posted is wrong. Ignorant or intentionally misleading…can’t really tell…but wrong nonetheless. BYD builds these vehicles in LA County with LA County workers and their vehicles are the most reliable and respected electric buses out there today. Wait, what a cooperation with Foothill transit? ?? Who would operate the route? Vermont Subway from Wilshire to Expo. Wow that would be amazing. Umm, so is there a reason why the Vermont BRT and the Pasadena BRT aren’t the first Projects to be constructed on the Measure M list?? These 2 projects are pretty much the cheapest to build out of the bunch yet we have to wait another 5-10 years (yes, I know there’s still an environmental review as well) to finally be able to ride them?? I know other projects have a priority because of the potential ridership forecast but these 2 BRT lines that can be done in 2-3 years shouldn’t have to suffer as a result of the more expensive projects. To think both projects could be up and running by 2022 if they were actually the first ones. Also, I do hope that there will be a hybrid street/freeway option for the NoHo-Pasadena BRT, as there could be at least a few less stops (looking at Marengo, Figueroa and Verdugo) on the primary preferred street routing and using the freeway on both ends can speed the line up a bit.